Is a mountain bike with a hidden motor faster for XC racing? 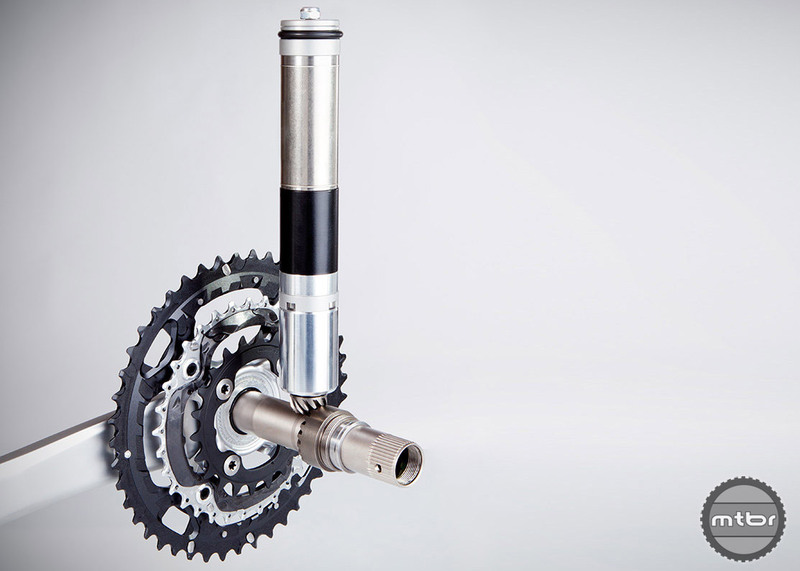 The Vivax motor is hidden in the downtube and turns the bottom bracket with a one-way bearing (click to enlarge). Hidden motors have been causing a ton of controversy in the road cycling world for the last couple of months after one was found in a race. Yes, we know, unbelievable. Anyway, the GMBN got to thinking: if these motors are used on the road and in cyclocross, does that mean that there’s an advantage to having one on a cross-country bike? Check the video to find out about the results. The motor used in this bike is called the Vivax found here www.vivax-assist.com. It is the most well-known one in existence today providing 150 watts of power for an hour and a half while adding 4 kg or 9 lbs of weight. The motor operates with a manual switch that activates a seat tube motor to drive the bottom bracket at a specified cadence. Since there is no clutch mechanism, when the rider takes his feet off the pedals, the cranks keep spinning. When the rider freewheels and stops pedaling, the motor shuts off automatically and needs to be turned back on to provide assist again. It is a very crude and inefficient system for the variable power demands of mountain bike trails. There may be other, more advanced systems that exist now that we are unaware of. Certainly, the advancements with these kinds of technologies will be rapid in the years to come. In the test, they failed to tell us the amount of climbing involved and the type and consistency of the climbs. The motor they were using will be more effective on a course with a long, consistent climb that will allow a rider to utilize the motor all the way up a hill. Given that the motor shuts off every time the rider freewheels, it is pretty inefficient for any kind of technical riding. Perhaps the biggest failure of this test is the bikes are not identical or even comparable. The human powered ‘only’ bike is a carbon Canyon bike with the best components available. It has full XTR, carbon wheels and 500 gram Schwalbe Rocket Ron tires. The assisted bike is an aluminum ‘no-name’ bike with mid range components and Schwalbe Racing Ralph tires. By our calculations, it is 4 lbs heavier than the carbon rig. The Vivax assist system adds 4 lbs of weight to the bike. Thus the aluminum ‘assisted’ bike ends up weighing 8 lbs more. Given identical bikes and a course with more extended climbs, we have no doubt the assisted bike will have an advantage over the normal bike. And in the coming years with more powerful motors and lighter batteries, the advantage will just grow. Thus, testing needs to be developed and instituted in XC racing to prevent this form of cheating in bike races. This explains why I’m always last!! Take a good look at how all this goes together, (hidden motor, hidden battery pack, hidden switch) it was specifically designed for cheating. Anyone using/ purchasing this was not thinking for commuting, they wanted to cheat but were afraid of needles. I wonder many riders will show up at club rides with motor assisted bikes so they can drop other riders on the sly? The rec riders who equip their bikes with the Vivax motor want to have motor assist, but don’t want anyone to know. There are more powerful systems on the market, but visually it’s obvious that they’re motor assisted. Just like the cx rider that was caught, the sly cyclist will be found out and be mighty embarrassed.